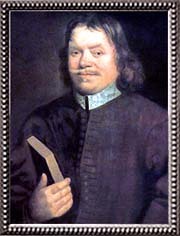 JOHN BUNYAN, English religious writer, was born at Elstow, about a mile from Bedford, in November 1628. His father, Thomas Bunyan,1 was a tinker, or, as he described himself, a "brasier." The tinkers then formed a hereditary caste, which was held in no high estimation. Bunyan's father had a fixed residence, and was able to send his son to a village school where reading and writing were taught. The years of John's boyhood were those during which the Puritan spirit was in the highest vigour all over England; and nowhere had that spirit more influence than in Bedfordshire. It is not wonderful, therefore, that a lad to whom nature had given a powerful imagination and sensibility which amounted to a disease, should have been early haunted by religious terrors. Before he was ten his sports were interrupted by fits of remorse and despair; and his sleep was disturbed by dreams of fiends trying to fly away with him. As he grew older his mental conflicts became still more violent. The strong language in which he described them strangely misled all his earlier biographers except Southey. It was long an ordinary practice with pious writers to cite Bunyan as an instance of the supernatural power of divine grace to rescue the human soul from the lowest depths of wickedness. He is called in one book the most notorious of profligates; in another, the brand plucked from the burning. It is quite certain that Bunyan was, at eighteen, what, in any but the most austerely puritanical circles, would have been considered as a young man of singular gravity and innocence. Indeed, it may be remarked that he, like many other penitents who, in general terms, acknowledge themselves to have been the worst of mankind, fired up, and stood vigorously on his defence, whenever any particular charge was brought against him by others. He declares, it is true, that he had let loose the reins on the neck of his lusts, that he had delighted in all transgressions against the divine law, and that he had been the ringleader of the youth of Elstow in all manner of vice. But when those who wished him ill accused him of licentious amours, he called on God and the angels to attest his purity. No woman, he said, in heaven, earth or hell, could charge him with having ever made any improper advances to her. Not only had he been strictly faithful to his wife; but he had, even before his marriage, been perfectly spotless. It does not appear from his own confessions, or from the railings of his enemies, that he ever was drunk in his life. One bad habit he contracted, that of using profane language; but he tells us that a single reproof cured him so effectually that he never offended again. A rector of the school of Laud would have held such a young man up to the whole parish as a model. But Bunyan's notions of good and evil had been learned in a very different school; and he was made miserable by the conflict between his tastes and his scruples. When he was about seventeen the ordinary course of his life was interrupted by an event which gave a lasting colour to his thoughts. He enlisted in the Parliamentary army,2 and served during the decisive campaign of 1645. All that we know of his military career is, that, at the siege of some town,3 one of his comrades, who had marched with the besieging army instead of him, was killed by a shot. Bunyan ever after considered himself as having been saved from death by the special interference of Providence. It may be observed that his imagination was strongly impressed by the glimpse which he had caught of the pomp of war. To the last he loved to draw his illustrations of sacred things from camps and fortresses, from guns, drums, trumpets, flags of truce, and regiments arrayed each under its own banner. His Greatheart, his Captain Boanerges and his Captain Credence are evidently portraits, of which the originals were among those martial saints who fought and expounded in Fairfax's army. In 1646 Bunyan returned home and married about two years later. His wife had some pious relations, and brought him as her only portion some pious books. His mind, excitable by nature, very imperfectly disciplined by education, and exposed to the enthusiasm which was then epidemic in England, began to be fearfully disordered. The story of the struggle is told in Bunyan's Grace Abounding. In outward things he soon became a strict Pharisee. He was constant in attendance at prayers and sermons. His favourite amusements were, one after another, relinquished, though not without many painful struggles. In the middle of a game at tipcat he paused, and stood staring wildly upwards with his stick in his hand. He had heard a voice asking him whether he would leave his sins and go to heaven, or keep his sins and go to hell; and he had seen an awful countenance frowning on him from the sky. The odious vice of bell-ringing he renounced; but he still for a time ventured to go to the church tower and look on while others pulled the ropes. But soon the thought struck him that, if he persisted in such wickedness, the steeple would fall on his head; and he fled in terror from the accursed place. To give up dancing on the village green was still harder; and some months elapsed before he had the fortitude to part with his darling sin. When this last sacrifice had been made, he was, even when tried by the maxims of that austere time, faultless. All Elstow talked of him as an eminently pious youth. But his own mind was more unquiet than ever. Having nothing more to do in the way of visible reformation, yet finding in religion no pleasures to supply the place of the juvenile amusements which he had relinquished, he began to apprehend that he lay under some special malediction; and he was tormented by a succession of fantasies which seemed likely to drive him to suicide or to Bedlam. At one time he took it into his head that all persons of Israelite blood would be saved, and tried to make out that he partook of that blood; but his hopes were speedily destroyed by his father, who seems to have had no ambition to be regarded as a Jew. At another time Bunyan was disturbed by a strange dilemma: "If I have not faith, I am lost; if I have faith, I can work miracles." He was tempted to cry to the puddles between Elstow and Bedford, "Be ye dry," and to stake his eternal hopes on the event. Then he took up a notion that the day of grace for Bedford and the neighbouring villages was past; that all who were to be saved in that part of England were already converted; and that he had begun to pray and strive some months too late. Then he was harassed by doubts whether the Turks were not in the right and the Christians in the wrong. Then he was troubled by a maniacal impulse which prompted him to pray to the trees, to a broomstick, to the parish bull. As yet, however, he was only entering the valley of the shadow of death. Soon the darkness grew thicker. Hideous forms floated before him. Sounds of cursing and wailing were in his ears. His way ran through stench and fire, close to the mouth of the bottomless pit. He began to be haunted by a strange curiosity about the unpardonable sin, and by a morbid longing to commit it. But the most frightful of all the forms which his disease took was a propensity to utter blasphemy, and especially to renounce his share in the benefits of the redemption. Night and day, in bed, at table, at work, evil spirits, as he imagined, were repeating close to his ear the words, "Sell him, sell him." He struck at the hobgoblins; he pushed them from him; but still they were ever at his side. He cried out in answer to them, hour after hour, "Never, never; not for thousands of worlds; not for thousands." At length, worn out by this long agony, he suffered the fatal words to escape him, "Let him go if he will." Then his misery became more fearful than ever. He had done what could not be forgiven. He had forfeited his part of the great sacrifice. Like Esau, he had sold his birthright; and there was no longer any place for repentance. "None," he afterwards wrote, "knows the terrors of those days but myself." He has described his sufferings with singular energy, simplicity and pathos. He envied the brutes; he envied the very stones on the street, and the tiles on the houses. The sun seemed to withhold its light and warmth from him. His body, though cast in a sturdy mould, and though still in the highest vigour of youth, trembled whole days together with the fear of death and judgment. He fancied that this trembling was the sign set on the worst reprobates, the sign which God had put on Cain. The unhappy man's emotion destroyed his power of digestion. He had such pains that he expected to burst asunder like Judas, whom he regarded as his prototype. Neither the books which Bunyan read, nor the advisers whom he consulted, were likely to do much good in a case like his. His small library had received a most unseasonable addition, the account of the lamentable end of Francis Spira. One ancient man of high repute for piety, whom the sufferer consulted, gave an opinion which might well have produced fatal consequences. "I am afraid," said Bunyan, "that I have committed the sin against the Holy Ghost." "Indeed," said the old fanatic, "I am afraid that you have." At length the clouds broke; the light became clearer and clearer; and the enthusiast who had imagined that he was branded with the mark of the first murderer, and destined to the end of the arch-traitor, enjoyed peace and a cheerful confidence in the mercy of God. His fortitude is the more extraordinary because his domestic feelings were unusually strong. Indeed, he was considered by his stern brethren as somewhat too fond and indulgent a parent. He had four small children, and among them a daughter who was blind, and whom he loved with peculiar tenderness. He could not, he said, bear even to let the wind blow on her; and now she must suffer cold and hunger; she must beg; she must be beaten; "yet," he added, "I must, I must do it." His second wife, whom he had married just before his arrest, tried in vain for his release; she even petitioned the House of Lords on his behalf. While he lay in prison he could do nothing in the way of his old trade for the support of his family. He determined, therefore, to take up a new trade. He learned to make long-tagged thread laces; and many thousands of these articles were furnished by him to the hawkers. While his hands were thus busied he had other employments for his mind and his lips. He gave religious instruction to his fellow-captives, and formed from among them a little flock, of which he was himself the pastor. He studied indefatigably the few books which he possessed. His two chief companions were the Bible and Foxe's Book of Martyrs. His knowledge of the Bible was such that he might have been called a living concordance; and on the margin of his copy of the Book of Martyrs are still legible the ill-spelt lines of doggerel in which he expressed his reverence for the brave sufferers, and his implacable enmity to the mystical Babylon. Prison life gave him leisure to write, and during his first imprisonment he wrote, in addition to several tracts and some verse, Grace Abounding to the Chief of Sinners, the narrative of his own religious experience. The book was published in 1666. A short period of freedom was followed by a second offence and a further imprisonment. Bunyan's works were coarse, indeed, but they showed a keen mother wit, a great command of the homely mother tongue, an intimate knowledge of the English Bible, and a vast and dearly bought spiritual experience. They therefore, when the corrector of the press had improved the syntax and the spelling, were well received. Much of Bunyan's time was spent in controversy. He wrote sharply against the Quakers, whom he seems always to have held in utter abhorrence. He wrote against the liturgy of the Church of England. No two things, according to him, had less affinity than the form of prayer and the spirit of prayer. "Those," he said with much point, "who have most of the spirit of prayer are all to be found in gaol; and those who have most zeal for the form of prayer are all to be found at the alehouse." The doctrinal Articles, on the other hand, he warmly praised and defended. The most acrimonious of all his works is his Defence of Justification by Faith, an answer to what Bunyan calls "the brutish and beastly latitudinarianism" of Edward Fowler, afterwards bishop of Gloucester, an excellent man, but not free from the taint of Pelagianism. Bunyan had also a dispute with some of the chiefs of the sect to which he belonged. He doubtless held with perfect sincerity the distinguishing tenet of that sect, but he did not consider that tenet as one of high importance, and willingly joined in communion with pious Presbyterians and Independents. The sterner Baptists, therefore, loudly pronounced him a false brother. A controversy arose which long survived the original combatants. The cause which Bunyan had defended with rude logic and rhetoric against Kiffin and Danvers has since been pleaded by Robert Hall with an ingenuity and eloquence such as no polemical writer has ever surpassed. During the years which immediately followed the Restoration, Bunyan's confinement seems to have been strict. But as the passions of 1660 cooled, as the hatred, with which the Puritans had been regarded while their reign was recent, gave place to pity, he was less and less harshly treated. The distress of his family, and his own patience, courage and piety, softened the hearts of his judges. Like his own Christian in the cage, he found protectors even among the crowd at Vanity Fair. The bishop of the diocese, Dr. Barlow, is said to have interceded for him. At length the prisoner was suffered to pass most of his time beyond the walls of the gaol, on condition, as it should seem, that he remained within the town of Bedford. He owed his complete liberation to one of the worst acts of one of the worst governments that England has ever seen. In 1671 the Cabal was in power. King Charles II had concluded the treaty by which he bound himself to set up the Roman Catholic religion in England. The first step which he took towards that end was to annul, by an unconstitutional exercise of his prerogative, all the penal statutes against the Roman Catholics; and in order to disguise his real design, he annulled at the same time the penal statutes against Protestant nonconformists. Bunyan was consequently set at large.6 In the first warmth of his gratitude he published a tract, in which he compared Charles to that humane and generous Persian king, who, though not himself blest with the light of the true religion, favoured the chosen people, and permitted them, after years of captivity, to rebuild their beloved temple. Before he left his prison he had begun the book which has made his name immortal.7 The history of that book is remarkable. The author was, as he tells us, writing a treatise, in which he had occasion to speak of the stages of the Christian progress. He compared that progress, as many others had compared it, to a pilgrimage. Soon his quick wit discovered innumerable points of similarity which had escaped his predecessors. Images came crowding on his mind faster than he could put them into words, quagmires and pits, steep hills, dark and horrible glens, soft vales, sunny pastures, a gloomy castle, of which the courtyard was strewn with the skulls and bones of murdered prisoners, a town all bustle and splendour, like London on the Lord Mayor's Day, and the narrow path, straight as a rule could make it, running on up hill and down hill, through city and through wilderness, to the Black River and the Shining Gate. He had found out, as most people would have said, by accident, as he would doubtless have said, by the guidance of Providence, where his powers lay. He had no suspicion, indeed, that he was producing a masterpiece. He could not guess what place his allegory would occupy in English literature; for of English literature he knew nothing. Those who suppose him to have studied the Faery Queen might easily be confuted, if this were the proper place for a detailed examination of the passages in which the two allegories have been thought to resemble each other. The only work of fiction, in all probability, with which he could compare his Pilgrim was his old favourite, the legend of Sir Bevis of Southampton. He would have thought it a sin to borrow any time from the serious business of his life, from his "expositions," his controversies and his lace tags, for the purpose of amusing himself with what he considered merely as a trifle. It was only, he assures us, at spare moments that he returned to the House Beautiful, the Delectable Mountains and the Enchanted Ground. He had no assistance. Nobody but himself saw a line till the whole was complete. He then consulted his pious friends. Some were pleased. Others were much scandalized. It was a vain story, a mere romance, about giants, and lions, and goblins, and warriors, sometimes fighting with monsters, and sometimes regaled by fair ladies in stately palaces. The loose atheistical wits at Will's might write such stuff to divert the painted Jezebels of the court; but did it become a minister of the gospel to copy the evil fashions of the world? There had been a time when the cant of such fools would have made Bunyan miserable. But that time was past; and his mind was now in a firm and healthy state. He saw that in employing fiction to make truth clear and goodness attractive, he was only following the example which every Christian ought to propose to himself; and he determined to print. The Pilgrim's Progress was published in February 1678. Soon the irresistible charm of a book which gratified the imagination of the reader with all the action and scenery of a fairy tale, which exercised his ingenuity by setting him to discover a multitude of curious analogies, which interested his feelings for human beings, frail like himself, and struggling with temptations from within and from without, which every moment drew a smile from him by some stroke of quaint yet simple pleasantry, and nevertheless left on his mind a sentiment of reverence for God and of sympathy for man, began to produce its effect. In puritanical circles, from which plays and novels were strictly excluded, that effect was such as no work of genius, though it were superior to the Iliad, to Don Quixote or to Othello, can ever produce on a mind accustomed to indulge in literary luxury. A second edition came out in the autumn with additions; and the demand became immense. The eighth edition, which contains the last improvements made by the author, was published in 1682, the ninth in 1684, the tenth in 1685. The help of the engraver had early been called in; and tens of thousands of children looked with terror and delight on execrable copperplates, which represented Christian thrusting his sword into Apollyon, or writhing in the grasp of Giant Despair. In Scotland, and in some of the colonies, the Pilgrim was even more popular than in his native country. Bunyan has told us, with very pardonable vanity, that in New England his dream was the daily subject of the conversation of thousands, and was thought worthy to appear in the most superb binding. He had numerous admirers in Holland, and amongst the Huguenots of France. He continued to work the gold-field which he had discovered, and to draw from it new treasures, not indeed with quite such ease and in quite such abundance as when the precious soil was still virgin, but yet with success, which left all competition far behind. In 1680 appeared the Life and Death of Mr Badman; in 1684 the second part of the Pilgrim's Progress. In 1682 appeared the Holy War, which if the Pilgrim's Progress did not exist, would be the best allegory that ever was written. Bunyan's place in society was now very different from what it had been. There had been a time when many dissenting ministers, who could talk Latin and read Greek, had affected to treat him with scorn. But his fame and influence now far exceeded theirs. He had so great an authority among the Baptists that he was popularly called Bishop Bunyan. His episcopal visitations were annual. From Bedford he rode every year to London, and preached there to large and attentive congregations. From London he went his circuit through the country, animating the zeal of his brethren, collecting and distributing alms and making up quarrels. The magistrates seem in general to have given him little trouble. But there is reason to believe that, in the year 1685, he was in some danger of again occupying his old quarters in Bedford gaol. In that year the rash and wicked enterprise of Monmouth gave the government a pretext for prosecuting the nonconformists; and scarcely one eminent divine of the Presbyterian, Independent or Baptist persuasion remained unmolested. Baxter was in prison: Howe was driven into exile: Henry was arrested. Two eminent Baptists, with whom Bunyan had been engaged in controversy, were in great peril and distress. Danvers was in danger of being hanged; and Kiffin's grandsons were actually hanged. The tradition is that, during those evil days, Bunyan was forced to disguise himself as a wagoner, and that he preached to his congregation at Bedford in a smock-frock, with a cart-whip in his hand. But soon a great change took place. James II was at open war with the church, and found it necessary to court the dissenters. Some of the creatures of the government tried to secure the aid of Bunyan. They probably knew that he had written in praise of the indulgence of 1672, and therefore hoped that he might be equally pleased with the indulgence of 1687. But fifteen years of thought, observation and commerce with the world had made him wiser. Nor were the cases exactly parallel. Charles was a professed Protestant; James was a professed Papist. The object of Charles's indulgence was disguised; the object of James's indulgence was patent. Bunyan was not deceived. He exhorted his hearers to prepare themselves by fasting and prayer for the danger which menaced their civil and religious liberties, and refused even to speak to the courtier who came down to remodel the corporation of Bedford, and who, as was supposed, had it in charge to offer some municipal dignity to the bishop of the Baptists. Bunyan did not live to see the Revolution.8 In the summer of 1688 he undertook to plead the cause of a son with an angry father, and at length prevailed on the old man not to disinherit the young one. This good work cost the benevolent intercessor his life. He had to ride through heavy rain. He came drenched to his lodgings on Snow Hill, was seized with a violent fever, and died in a few days (August 31). He was buried in Bunhill Fields; and many Puritans, to whom the respect paid by Roman Catholics to the reliques and tombs of saints seemed childish or sinful, are said to have begged with their dying breath that their coffins might be placed as near as possible to the coffin of the author of the Pilgrim's Progress. The fame of Bunyan during his life, and during the century which followed his death, was indeed great, but was almost entirely confined to religious families of the middle and lower classes. Very seldom was he during that time mentioned with respect by any writer of great literary eminence. Young coupled his prose with the poetry of the wretched D'Urfey. In the Spiritual Quixote, the adventures of Christian are ranked with those of Jack the Giant-Killer and John Hickathrift. Cowper ventured to praise the great allegorist, but did not venture to name him. It is a significant circumstance that, for a long time all the numerous editions of the Pilgrim's Progress were evidently meant for the cottage and the servants' hall. The paper, the printing, the plates, were all of the meanest description. In general, when the educated minority and the common people differ about the merit of a book, the opinion of the educated minority finally prevails. The Pilgrim's Progress is perhaps the only book about which the educated minority has come over to the opinion of the common people. The attempts which have been made to improve and to imitate this book are not to be numbered. It has been done into verse; it has been done into modern English. The Pilgrimage of Tender Conscience, the Pilgrimage of Good Intent, the Pilgrimage of Seek-Truth, the Pilgrimage of Theophilus, the Infant Pilgrim, the Hindoo Pilgrim, are among the many feeble copies of the great original. But the peculiar glory of Bunyan is that those who most hated his doctrines have tried to borrow the help of his genius. A Catholic version of his parable may be seen with the head of the virgin in the title-page. On the other hand, those Antinomians for whom his Calvinism is not strong enough, may study the Pilgrimage of Hephzibah, in which nothing will be found which can be construed into an admission of free agency and universal redemption. But the most extraordinary of all the acts of Vandalism by which a fine work of art was ever defaced was committed in the year 1853. It was determined to transform the Pilgrim's Progress into a Tractarian book. The task was not easy; for it was necessary to make two sacraments the most prominent objects in the allegory, and of all Christian theologians, avowed Quakers excepted, Bunyan was the one in whose system the sacraments held the least prominent place. However, the Wicket Gate became a type of baptism, and the House Beautiful of the eucharist. The effect of this change is such as assuredly the ingenious person who made it never contemplated. For, as not a single pilgrim passes through the Wicket Gate in infancy, and as Faithful hurries past the House Beautiful without stopping, the lesson which the fable in its altered shape teaches, is that none but adults ought to be baptized, and that the eucharist may safely be neglected. Nobody would have discovered from the original Pilgrim's Progress that the author was not a Paedobaptist. To turn his book into a book against Paedobaptism, was an achievement reserved for an Anglo-Catholic divine. Such blunders must necessarily be committed by every man who mutilates parts of a great work, without taking a comprehensive view of the whole. Bunyan's works were first partially collected in a folio volume (1692) by his friend Charles Doe. A larger edition (2 vols., 1736-1737) was edited by Samuel Wilson of the Barbican. In 1853 a good edition (3 vols., Glasgow) was produced by George Offer. Southey's edition (1830) of the Pilgrim's Progress contained his Life of Bunyan. Since then various editions of the Pilgrim's Progress, many illustrated (by Cruikshank, Byam Shaw, W. Strang and others), have appeared. An interesting life by "the author of Mark Rutherford" (W. Hale White) was published in 1904. Other lives are by J. A. Froude (1880) in the "English Men of Letters" series, and E. Venables (1888); but the standard work on the subject is John Bunyan; his Life, Times and Work (1885), by the Rev. J. Brown of Bedford. A bronze statue, by Boehm, was presented to the town by the duke of Bedford in 1874. 1 The name, in various forms as Buignon, Buniun, Bonyon or Binyan, appears in the local records of Elstow and the neighbouring parishes at intervals from as far back as 1199. They were small freeholders, but all the property except the cottage had been lost in the time of Bunyan's grandfather. Bunyan's own account of his family as the "meanest and most despised of all the families of the land" must be put down to his habitual self-depreciation. Thomas Bunyan had a forge and workshop at Elstow. 3 There is no means of identifying the place besieged. It has been assumed to be Leicester, which was captured by the Royalists in May 1645, and recovered by Fairfax in the next month. 4 Bunyan had joined, in 1653, the nonconformist community which met under a certain Mr Gifford at St John's church, Bedford. This congregation was not Baptist, properly so called, as the question of baptism, with other doctrinal points, was left open. When Bunyan removed to Bedford in 1655, he became a deacon of this church, and two years later he was formally recognized as a preacher, his fame soon spreading through the neighbouring counties. His wife died soon after their removal to Bedford, and he also lost his friend and pastor, Mr. Gifford. His earliest work was directed against Quaker mysticism and appeared in 1656. It was entitled Some Gospel Truths Opened; it was followed in the same year by second tract in the same sense, A Vindication of Gospel Truths. 5 He was not, however, as has often been stated, confined in the old gaol which stood on the bridge over the Ouse, but in the county gaol. 6 His formal pardon is dated the 13th of September 1672; but five months earlier he had received a royal licence to preach, and acted for the next three years as pastor of the nonconformist body to which he belonged, in a barn on the site of which stands the present Bunyan Meeting. 7 It is now generally supposed that Bunyan wrote his Pilgrim's Progress , not during his twelve years' imprisonment, but during a short period of incarceration in 1675, probably in the old gaol on the bridge. 8 He had resumed his pastorate in Bedford after his imprisonment of 1675, and, although he frequently preached in London to crowded congregations, and is said in the last year of his life to have been, of course unofficially, chaplain to Sir John Shorter, lord mayor of London, he remained faithful to his own congregation. Cambridge: Cambridge University Press, 1910. 806-810. Created by Anniina Jokinen on October 3, 2003. Last updated January 24, 2007.